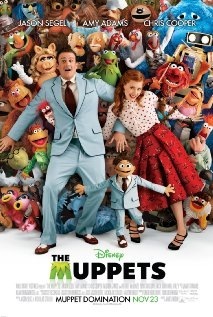 The Muppets movie was incredible. Done. Okay, I have more to say than that but considering my expectations were fairly low, I was truly surprised. The movie was legitimately funny, not just for kids but had a variety of clever references. The majority of the comedy was not just low-brow kids comedy but rather unexpected and fairly clever – at least at times. I felt as if some of the jokes would go over straight over children’s heads but that is fine by me! Specifically, The Muppets took advantage of “calling itself out” and making reference to itself. I am personally a big fan of fun movies that can point out some of the clichés in movies. The Muppets did a great job of incorporating clichés for comedic effect – not because they are unimaginative. Almost every scene in the movie had a cameo of some sort and they were great. They were incorporated into the movie and weren’t just fully thrown in for fun which was great. I could go on about the cameos but I don’t want to ruin the magic. For a full list, see the spoilers below. Some of the songs were a little lame but most were very good. The song “Man or Muppet” [YouTube Link] was my personal favourite. It was not just the song itself but the accompanying hilarity that made it so great along with the great cameo . . . it is really hard not to give anything away in these reviews! I have to be so cryptic. Anyways, after watching the movie you will see what I mean. Overall, the movie was great and I highly recommend it. You have to be in a happy-go-lucky mood though or you might not appreciate it as much. Also, disclosure: my view may be elevated because of my initially low expectations of the movie. A great movie for a night in, or out, with the girlfriend or family. Emily Blunt, James Carville, Leslie Feist, Whoopi Goldberg, Selena Gomez, Dave Grohl, Neil Patrick Harris, Judd Hirsch, John Krasinski, Jim Parsons, Rico Rodriguez, Mickey Rooney, Kristen Schaal, Sarah Silverman, Ken Jeong, Donald Glover.